Bookings must be made in advance and an allocated time slot will be given. Bikes will be completed ASAP and the owner will be informed if any delays occur. ATS Cycles cannot be held responsible for any delays due to parts not arriving on time from external suppliers. 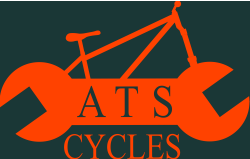 ATS Cycles offers a collection and return service, the price of this service is based upon the postcode that is given. Servicing and Repair prices do not include parts except where stated. Bikes and parts must be reasonably clean before any work is carried out, failure to comply with this will result in a cleaning charge. Please note these prices cover onsite repairs and collection and delivery options. A maximum of 4 bikes can be transported at any one time. If specialist tools are required your bike may need to be taken to the ATS Cycles workshop.